Just like your own chompers, pets' teeth need cleaning and care. Toothbrushing is an important step in maintaining their oral health. The perfect way to introduce your dog or cat to regular toothbrushing. Features a large head and a smaller head to accommodate dogs and cats of all sizes. The heads are set at ergonomically correct angles to aid in administration. Contains a delicious poultry-flavor enzymatic solution that cleans and polishes teeth. Does not foam and does not need to be rinsed. For dogs and cats. 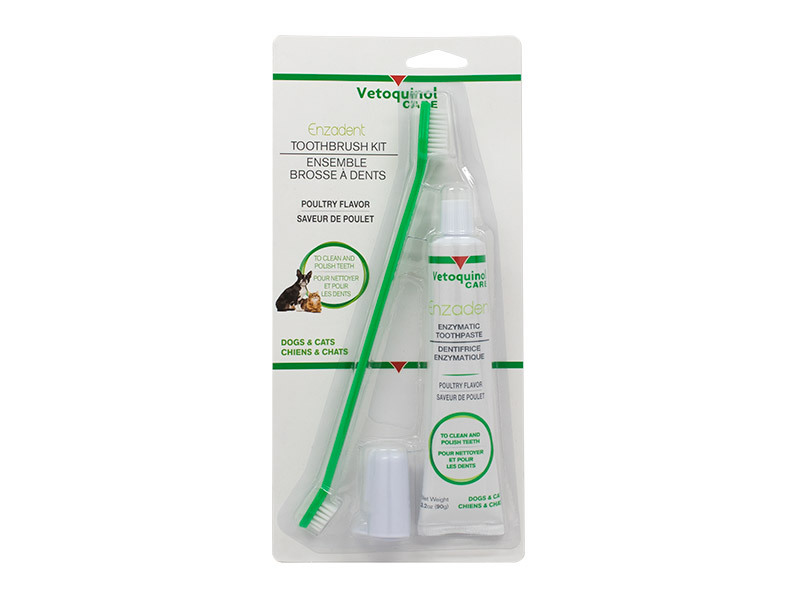 Contains everything your cat or dog needs for healthy teeth: enzymatic toothpaste, a toothbrush, and a fingerbrush. In dogs and cats, two-thirds of each tooth is hidden under the gums. Your pet can develop dental problems before you see it. Apply a small amount of Enzadent Toothpaste to an Enzadent Fingerbrush or Dual-Ended Toothbrush. Gently pull the lip up, exposing the teeth. In a circular motion, brush along the gumline. Tip: Brush only a few teeth the first time. Increase the amount each time you bush as your pet becomes more familiar with the process. Your veterinarian may give you specific instructions. Follow this professional advice closely. Consult your veterinarian before using the Enzadent Oral Care line. Follow the recommended administration on the package, unless otherwise instructed by your veterinarian. Triglyceride Omega helps maintain healthy skin and coat by supplying a natural source of omega-3 fatty acids.